Every person's needs are unique when it comes to tire inflators. Some want compact and simple. Others want POWER! Wondering what tire inflator is best for you? Analog or digital? 12V, 120V, direct connect or cordless? 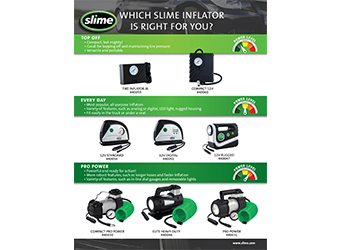 Check out this new Slime Tire Inflator Comparison Chart and easily compare inflators to find the one you need.